India defeated Australia by six wickets in the second one-day international at the Adelaide Oval to keep the series alive. 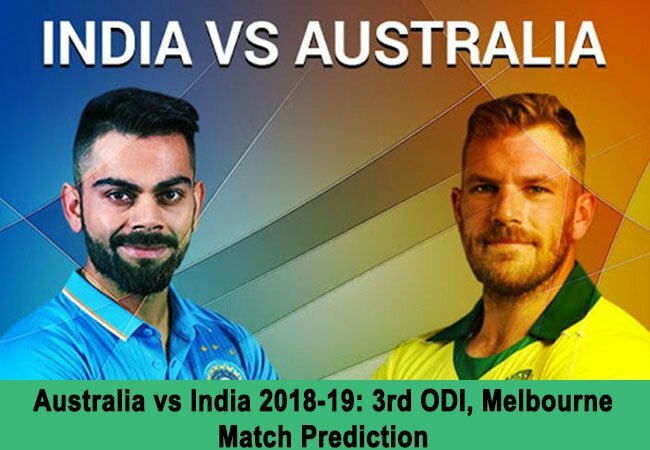 With the series poised at 1-1, the two teams will now move to the Melbourne Cricket Ground for the third and deciding ODI which will also be India’s final game of their tour. Australia have a strong ODI record at the MCG and they have won nine of their last eleven matches played at this ground. Australia have an inexperienced bowling attack and they have lost each of their previous five bilateral ODI series. Australia have won 9 out of the 14 ODIs they have played against India at the MCG, including the last three encounters. Toss will be key at the MCG. Four of the last five one-day internationals played at this ground have been won by the side bowling first. And with the wicket here expected to quicken up under lights, the toss-winning captain will probably prefer to chase in this match. Having lost the last game even after posting a big total would have surely dented Australia’s confidence. Most of the Indian batsmen have been in good form of late and the hosts will find themselves in a lot of problems if they are unable to remove India’s top three early on. However, their impressive ODI record at the MCG should give the Aussies some hope going into this match. They have won nine of their last eleven matches at this ground and have even beaten India here on the last three occasions. Although Australia have looked a better side in the limited-overs format as compared to the tests, we expect India to win this match and conclude what has been a very successful tour for them.